Familien, romantische Paare und alle fliegen Angler die exquisit eingerichtet Goldene Grizzly Cabin lieben, die "Land Ritz" von Paradise Valley betrachtet werden. Diese neue Hütte liegt auf einem 20 Hektar großen Grundstück und bietet Komfort und Eleganz für bis zu vier Erwachsene. Die Kabine verfügt über einen Holzofen, Jacuzzi-Wanne, eine Königin Schlafzimmer und und eine große, atemberaubende König Dachboden. Sie benötigen um sich zu entspannen? Unsere sorgfältig ausgewählten "Resort" Betten werden Sie sich wie Sie in einem Fünf-Sterne-Hotel sind das Gefühl, als Sie in ruhiger Lage im Schlaf "Paradies." Nur eine 35-minütige Panorama-Fahrt von Yellowstone, Nordeingang. Nur wenige Minuten von exzellenten Bach und Flussfischerei, sowie spektakulären Wanderwegen. Mountainbikes und Rucksäcke vor Ort, zur Nutzung bereit! Sehr ruhig, privat und ruhig gelegen! Komplettes Badezimmer mit Jacuzzi und Dusche im Erdgeschoss, plus die Hälfte-Bad im Dachgeschoss. We decided to experience Montana in the winter and booked another stay at the Golden Grizzly cabin. It was my wife, son, and myself. We had stayed here last summer and enjoyed the cabin, its location, and its amenities so much that we booked it again. The owners are wonderful hosts and make sure you have everything you need. The wood burning fireplace was great to have as it really warms the entire cabin and as you can imagine Montana is quite cold at night in February. The cabin is so clean and comfortable and everything you need is already present. This location in Paradise Valley is ideal. Some of the activities we did included: driving to Cooke City via the Lamar Valley in Yellowstone, took a dip in the boiling river in Yellowstone, skied at Big Sky, visited Chico Hot Springs, enjoyed pool and cocktails at the Old Saloon in Emigrant, and visited the historic district in downtown Livingston. Other times we just relaxed and enjoyed the cabin. The breathtaking views of snow capped mountains from literally anywhere in the cabin makes this a special place. Bottom line is that during any season this is a great cabin rental and I would strongly recommend. The owners go above and beyond to make sure your stay is pleasant and memorable. Thank you Pete and Derilynn. Wonderful experience. 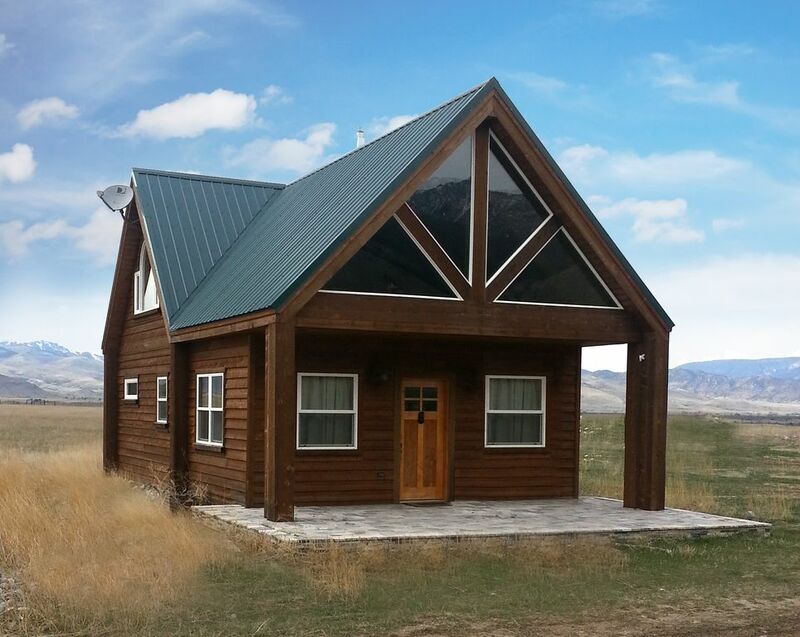 Rent this cabin if available! We stayed at 5 different places throughout Idaho and Montana on a recent trip. The Golden Grizzly was by far the best leg of the trip. This cabin is cozy and well stocked for anything you need. The surrounding views are beautiful and the location is ideal. About 30 miles from the North entrance of Yellowstone and maybe 20 miles from downtown Livingston. The owners are great hosts and clearly take pride in making sure their guests are taken care of. The two beds are very comfortable and the kitchen is well situated to cook meals. The jet tub in the bathroom is a great feature especially after long days exploring Yellowstone. Visit Old Saloon in the little town of Emigrant which is about 5 miles away. We had two adults and our 12 year old son and the cabin was perfect for us. AC is available if you need it. The stars at night will take your breath away. First Rate / Loved it! The Golden Grizzly Cabin is a wonderful place to stay if you like tranquility, comfort and beautiful surroundings. The cabin appointments are first class with a very comfortable bed, larger dining room table, comfortable living room furniture and a full kitchen with all the amenities necessary to prepare meals. We thoroughly enjoyed our stay at the Golden Grizzly Cabin and would return in a heart beat. Pete and Derilyn are gracious hosts offering total privacy while extending an open door helping hand if needed. This was perfect for our liking. This cabin has it all. Our hosts did a fantastic job building a custom guest cabin overlooking the mountains. It has wonderful amenities and everything one may need for a comfortable visit. Lots of character as well. We highly recommend the Golden Grizzly. The Ryan’s are so kind and helpful. The cabin was a great location for our family to explore Yellowstone but still feel away from it all. The cabin has everything you need with the nicest amenities and little extras that I have ever seen in a rental.